For the Swedish guided missile BOLIDE, see RBS 70. A bolide (French via Latin from the Greek βολίς bolís, "missile") is an extremely bright meteor, especially one that explodes in the atmosphere. In astronomy, it refers to a fireball about as bright as the full moon, and it is generally considered a synonym for a fireball. In geology, a bolide is a very large impactor. One definition describes a bolide as a fireball reaching an apparent magnitude of −14 or brighter — more than twice as bright as the full moon. Another definition describes a bolide as any generic large crater-forming impacting body whose composition (for example, whether it is a rocky or metallic asteroid, or an icy comet) is unknown. A superbolide is a bolide that reaches an apparent magnitude of −17 or brighter, which is roughly 100 times brighter than the full moon. Recent examples of superbolides include the Sutter's Mill meteorite and the Chelyabinsk meteor. The IAU has no official definition of "bolide", and generally considers the term synonymous with fireball, a brighter-than-usual meteor, however, the term generally applies to fireballs reaching an apparent magnitude −14 or brighter. Astronomers tend to use bolide to identify an exceptionally bright fireball, particularly one that explodes (sometimes called a detonating fireball). It may also be used to mean a fireball that is audible. Geologists use the term bolide in a somewhat different context than astronomers do. In geology, it indicates a very large impactor. For example, the Woods Hole Coastal and Marine Science Center of the USGS uses bolide for any large crater-forming impacting body whose origin and composition is unknown, as, for example, whether it was a stony or metallic asteroid, or a less dense, icy comet made of volatiles, such as water, ammonia and methane. Footage of a superbolide exploding over Chelyabinsk Oblast, Russia in 2013. 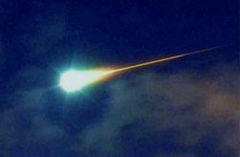 A bolide from the Geminids meteor shower (SAO RAS, vmag −3) in December 2010. Tunguska event of 1908 (imaged by a Soviet expedition in 1927). ^ "We are not Alone: Government Sensors Shed New Light on Asteroid Hazards". Universe Today. Retrieved 12 April 2015. ^ "Definition of BOLIDE". merriam-webster.com. ^ a b "Introduction: What is a Bolide?". Woodshole.er.usgs.gov. 1 April 1998. Retrieved 16 September 2011. Look up bolide in Wiktionary, the free dictionary.